Posted on Sat, Apr 7, 2012 : 5:58 a.m.
A New Jersey-based restaurant franchise called Jersey Mike’s Subs plans to open its first Michigan location this summer on Carpenter Road in Pittsfield Township. The location: a vacant 1,376-square-foot space situated between Starbucks Coffee and Great Clips in a retail center between Packard and Ellsworth. A cheese steak sandwich from Jersey Mike's Subs. Jersey Mike’s, which was founded in New Jersey in 1956, has more than 600 franchise locations open and under development nationwide. The menu consists of cold and hot subs, wraps and salads that are priced between $4 and $10. The Pittsfield Township location is under construction and should open in about 12 weeks, said Josie Capozzi, vice president of franchise relations for Jersey Mike’s. The space was listed with Angela Arcori and Bruce Baja of Signature Associates for an annual $19 per square foot. The site has two retail buildings, which are owned by Rudolph Libbe Properties. Other tenants include Leo’s Coney Island and Parda Credit Union. There still are several available suites that have remained unoccupied since the buildings were constructed in 2007. The reason: “Who knows whether it’s the location, the economy, rent or combination of all the above,” Arcori said. “I think that what Jersey Mike’s offers is an affordable, quality product, which in this market, that’s what people are looking for,” she added. Mon, Apr 9, 2012 : 2:58 a.m. I used to live in New Jersey while stationed there in the military. I will definitely check this out when in town to see my relatives. Sun, Apr 8, 2012 : 3:59 p.m.
looking forward to the $12 Philly Cheesesteak sub! NOT! Well, I just hope they don't charge that much for those as they do in LA area! Sun, Apr 8, 2012 : 1:04 a.m. I'd go with gabriel's cheese steak and Jersey Giant as the benchmark for philly cheese steaks and subs repsectively. If you are looking for the good sub take a drive out Michigan Ave. (okay, WAY out Michigan Ave.) to Vinnies. (just west of 275) By far the best sub around. Sat, Apr 7, 2012 : 4:36 p.m. I've never heard of them but it sounds good, I'll have to try them out. Sat, Apr 7, 2012 : 1:53 p.m. Sat, Apr 7, 2012 : 1:46 p.m. Sat, Apr 7, 2012 : 12:19 p.m. I used to frequent this place when I lived in South Bend. The news that they're opening up one here has me doing the happy dance. Sat, Apr 7, 2012 : 11:55 a.m. Sat, Apr 7, 2012 : 11:37 a.m. Sat, Apr 7, 2012 : 11:46 a.m. Thanks for catching that. I made the correction. Sat, Apr 7, 2012 : 10:47 a.m.
One thing that separates great east coast subs from the rest of the country? The bread. Hopefully Jersey Mike's will deliver and be successful. 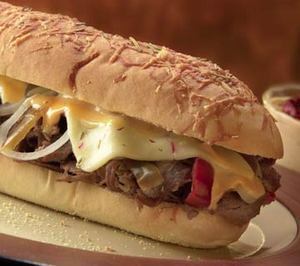 Just ask Joey's famous Philly Cheesesteaks in Livonia, who make **authentic** Philly steaks and subs, it's the bread! Mon, Apr 9, 2012 : 11:50 a.m.
DiBella's have great sandwiches. I must admit that Jimmy John's actually has a pretty good roll themselves. Sat, Apr 7, 2012 : 11:06 p.m. If you want subs with good crusty bread, go to DiBella's on Eisenhower. You gets lots of meat on the subs too. Think they are a chain sub shop from the East Coast too. Sat, Apr 7, 2012 : 10:09 p.m.
&quot;the crusty bread is the best&quot; Unfortunately, from looking at the Jersey Mike's web page, it looks like they use the same extra-thick &amp; soft bread found at places like Subway &amp; Panera. Here's hoping the in-person product is a little better, but based on the photos they show in their advertising, I'm not keeping any high expectations. It's gonna be hard to top Mancino's, Sottini's, and Mr. Spots for good Ann Arbor-area grinders in my opinion. Sat, Apr 7, 2012 : 3:08 p.m. I agree with your evaluation of a true Philly sub or hoagie. As a person born and raised in Philadelphia, the crusty bread is the best. To this day when I go home to visit, I always stop and pick up a few rolls!! Sat, Apr 7, 2012 : 1:12 p.m.
Mr. Spot's in A2 uses Amoroso's rolls as well but they still didn't have the 'authentic' taste I remembered from Philly. Still better than most in the area to me. Joey's has been on my to-do list for a while. Sat, Apr 7, 2012 : 10:36 a.m.
Great location! Parking is free. Welcome!